Each Weigh Safe Built in Scale Adjustable Hitch ball mount features a built in hydraulic scale engineered to measure tongue weight. This scale is designed to be accurate within a 50 pound range. The scale will allow you to easily and quickly ensure that your tongue weight stays within 10-15% of your gross trailer weight reducing liability while maximizing efficiency. The Weigh Safe Built in Scale Adjustable Hitch ball mount is the definition of adaptability and ease. With an array of possible combinations, you can switch between trailers in moments. The aluminum components have been engineered to allow for a cleaner movement and rotation of the slider to minimize downtime and maximize tow time. When you buy a Weigh Safe Built in Scale Adjustable Hitch ball mount you can expect the highest quality materials and expert engineering. With this product you will not only get the job done, but look good doing it. Milled Stainless Steel hitch balls will ensure that professional look, week after week and job after job. 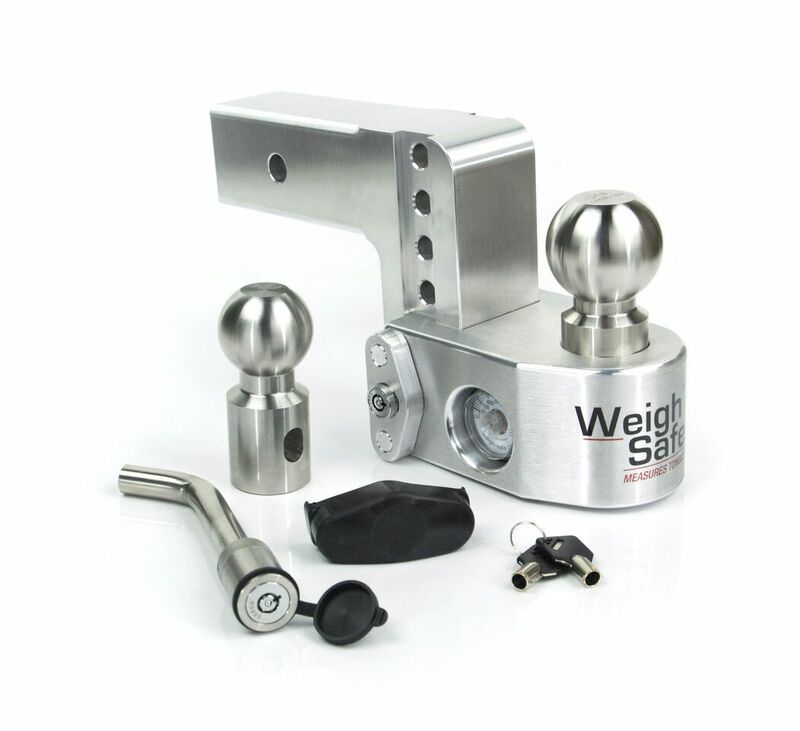 The aluminum components of the Weigh Safe Built in Scale Adjustable Hitch ball mount are made of 6061-T6 Aircraft Grade Aluminum and the tow balls are made of 303 Stainless Steel. You won’t find a better engineered ball mount on the market. Weigh-Safe strives to exceed the industry standard of quality and provides enough models to satisfy every need. with built in Weight Scale > 2 1/2" x 2 1/2"